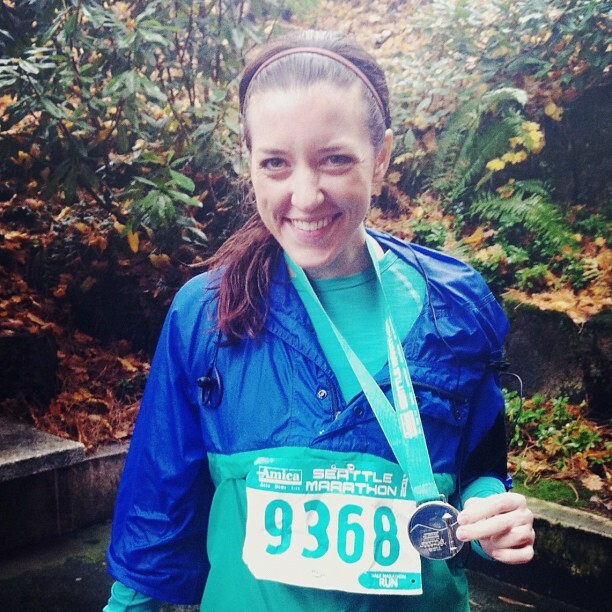 On Sunday, I ran the Seattle Half-Marathon, and man alive, was it fun. Back in September, I had the thought, “I want to train for something.” So I went online, looking for a race that would be in a city that I wanted to travel to, and a course that I would like to run. I realized that Seattle had a race on the Sunday after Thanksgiving; I did the math, and figured out that it was 12 weeks away, to the day. Serendipity (not the movie) – I started training that night. The 12 weeks flew by, and before I knew it, I was standing in a crowd of 11,000 people before the sun came up on Sunday morning. I didn’t train with anyone, and I didn’t run with anyone – I just showed up, jumped into the sea of runners, stared at the people around me, and then ran across the starting line and didn’t stop for 13.1 miles. I know that I’ve written about running before – how it’s not something that I’ve historically loved, how it’s not something that comes all that naturally, how the fact that I currently consider it one of my hobbies is utterly flabbergasting to me. But there I was, by my own volition, running my third half-marathon. For the first 10 miles, I ran a 9-minute mile pace. For a girl who never runs faster than 10-minute miles, I don’t know where that extra jolt came from – all I can think is that training at Mile High and then dropping to sea level is the way to go. The last 3 miles were a bit slower, but in the end, I cut 6 minutes off of my previous best time, finishing in 2:03:13. As I ran, I was struck with how much FUN I was having. I was just so happy – traveling through my favorite city on earth, my body cooperating better than I could have hoped, carrying me up hills and around turns and past the man with the hairy back and the woman with the long, whipping, Texas polygamist compound braid. I watched the people cheering on the sidelines, laughing at some of the signs (i.e. “Worst parade ever”). I saw my mom and our friend Lisa three times along the course; they win the prize for the best navigation of Seattle streets. At one point, I swear, I think I saw Vili Fualaau. I ran uphill, against the wind and the rain. I thought about the last several years, and how hard they’ve been, and how good they’ve been, and how the road has been uphill and against the wind and the rain – but man alive, this place is beautiful, and hot damn, I’m still breathing. congratulations on completing the race with a new PR and injury-free! did you follow a particular training schedule? i signed up for my first half in DC this coming March and i’m scared. My favorite uncle says “man alive” all the time and it always brings a smile to my face. He also describes good things as “gangbusters” so you could bring that back to. You know, if you’re looking for a third to man alive and hot damn. Hot damn – you go, girl! Congrats! 1. Have you read the short book “Manalive” by G.K. Chesterton? I just finished it on Sun. and think you might enjoy it. Reminded me that living life entails actually living. 2. Your running feats are inspirational to me – I hope someday to enjoy a 1/2 marathon as much as you just did. Way to go! You may not knows this, but you inspire me sooooo much when it comes to running. This post just makes me want to go out and run. Thanks for sharing Annie! Wow! I’m impressed. And I laughed out loud in my office at the Vili Fualaau comment. so glad you shared this! that’s awesome – you GO GIRL! happiness is contagious and it was great to see such a big smile! Man Alive! That is IMPRESSIVE! (caps are appropriate) I’m lucky to make it around Green Lake. Annie, you’re amazing! Congrats on the great race!!! Did you see the Gaffneys? I think they were there too. I am proud of you. and you inspire me too. This guy working with us always says “shoot heck” when he gets excited about anything…It just felt like that should be added to the list. Seattle is one of my favorite cities too. Super impressed that you ran there, I can barely walk downtown! Hot damn! I’m proud! Good work! This is great, friend. MAN ALIVE. Hot damn, girlfriend! 2:03 is pretty freakin’ fantastic. Impressive!!! What is it about running 13.1 miles with a bunch of other crazies that suddenly makes moving athletically for over two hours…fun? Such a good feeling. Keep that high alive! You beautifully summed up the paradox that is life- so very hard but so very good. Congratulations on running both of your races so well! is it wierd that i just started tearing up with reading this?